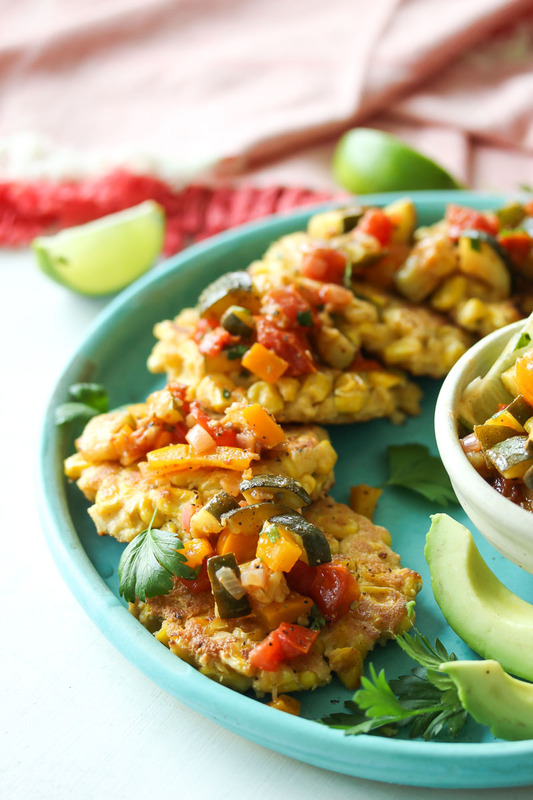 Chive and jalapeño corn fritters are pan-fried and served with zesty roasted zucchini salsa. This kid-friendly, gluten free meal is great for entertaining and makes delicious use of peak-of-summer produce. 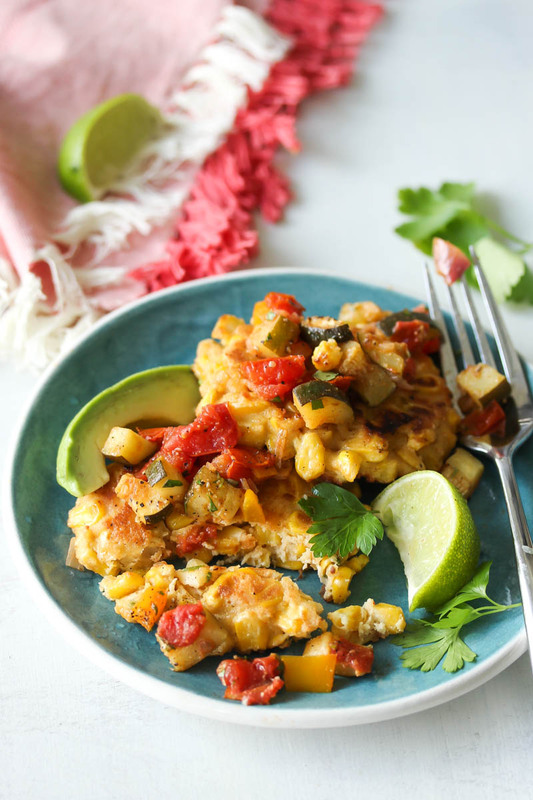 When is it not a good time for a crispy corn fritter?? I like to think of them as the most acceptable version of an afternoon pancake. (With more nutritional heft and less sugar-coma inducing side effects). These fritters are crispy on the outside and supremely creamy on the inside. The chives give them an herbaceous backbone while jalapeño adds just the right dose of heat to balance the sweet corn. Summer squashes are abundant in backyard gardens, farmers’ markets, and grocery stores this time of year. If you’re running out of room in your refrigerator to store them, this recipe is for you. Or if you just love a great height-of-summer meal! I’ve been consuming my weight in both tomatoes and zucchini lately. One of the best things about living in Alabama is how many locals grow their own summer produce. If I don’t pick up a fresh bunch of basil or bag of zucchini at the farmers market, I can likely count on a neighbor, friend, or coworker to offer up some of their homegrown goods to refill my supply. It’s a beautiful thing! This salsa may be filed under the condiment category, but it can double as a salad or grain bowl topper, and pairs beautifully with grilled fish or chicken. The zucchini and tomato transform upon roasting, turning rich and silky with deep roasted flavor. If you prefer a little heat in your salsa, feel free to add a dash of crushed red pepper flakes or diced jalapeño to the mix. 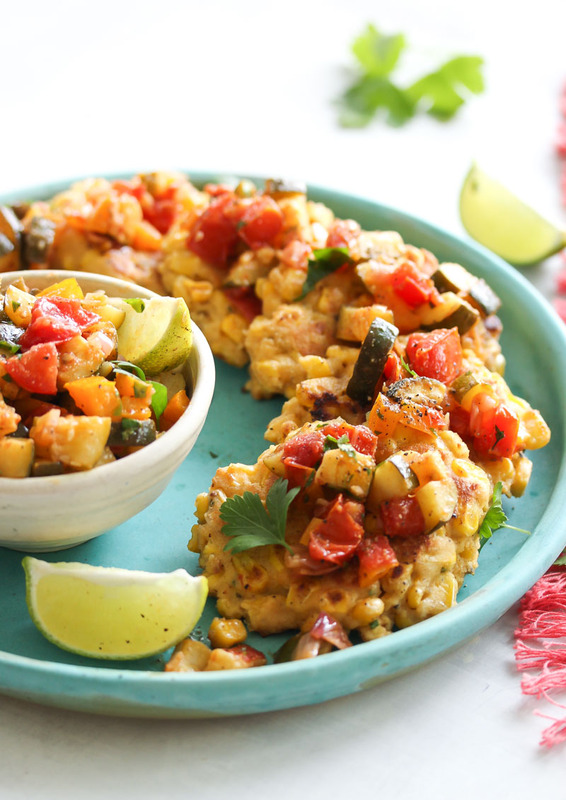 Enjoy this kid-friendly, nutrient-packed recipe at your next summer cookout, potluck, or weeknight dinner. The bright flavors, appeasing textures, and beautiful pop of colors will enlighten your senses and appeal to even the pickiest eaters. We’ve got 5 weeks of summer left—let’s make the most of them! 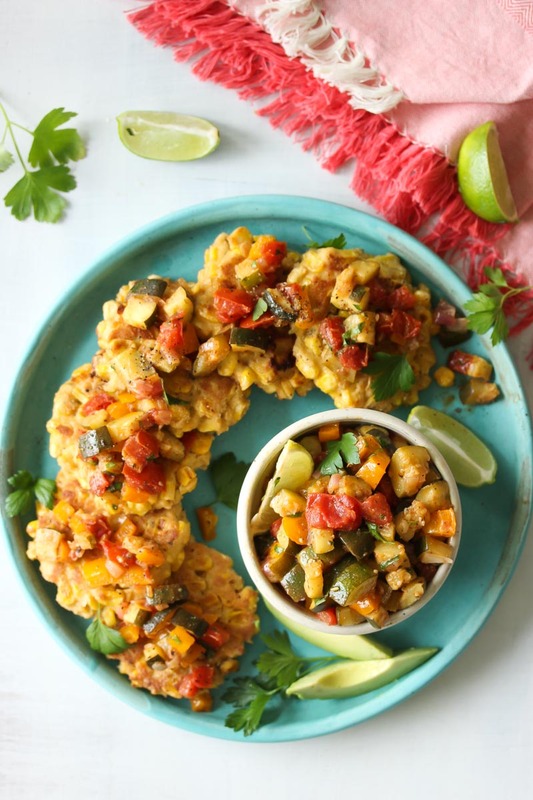 Chive and jalapeño corn fritters are pan-fried and served with zesty roasted zucchini salsa. This kid-friendly, gluten free meal is great for entertaining and makes delicious use of peak-of-summer produce. 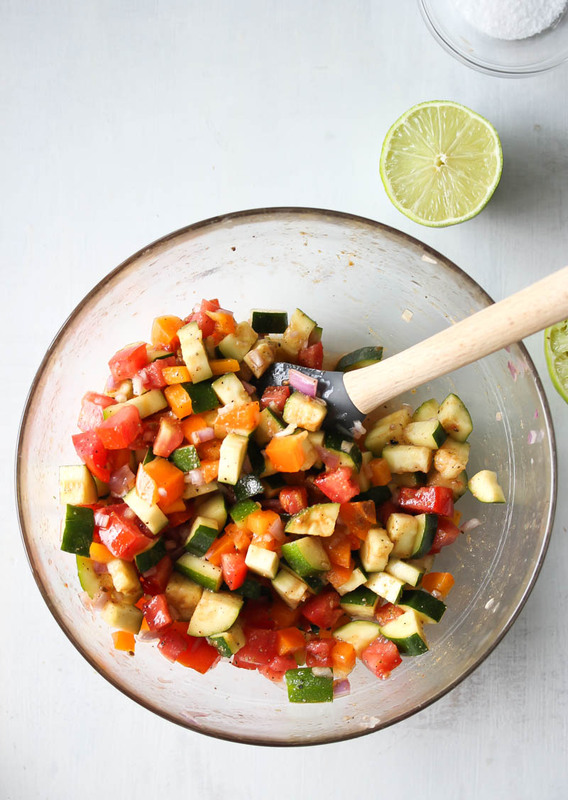 Prepare zucchini salsa by combining zucchini, tomatoes, bell pepper, shallots, 1 Tbsp. lime juice, olive oil, cumin, salt, and pepper in a large bowl; stir well. Spread evenly on a greased, rimmed baking sheet. Bake at 400°F for 20 to 25 minutes, tossing once halfway through, until zucchini and tomatoes are browned. Set aside to cool. Transfer to a bowl; toss with remaining 2 Tbsp. lime juice and cilantro. Prepare corn fritters by placing eggs, chives, jalapeño, lime juice, garlic, cumin, salt, and pepper in a large bowl; stir with a whisk. Add corn and ½ cup almond flour; stir to combine. Add remaining almond flour in 1 Tbsp. increments until mixture is firm enough to handle. Chill for 20 minutes. Heat oil in a large nonstick skillet over medium. Form a scant ⅓ cup corn mixture into a patty; repeat with remaining corn mixture to form 6 patties. Working in batches of 3, cook fritters, turning once, until brown, 5 to 6 minutes per side. 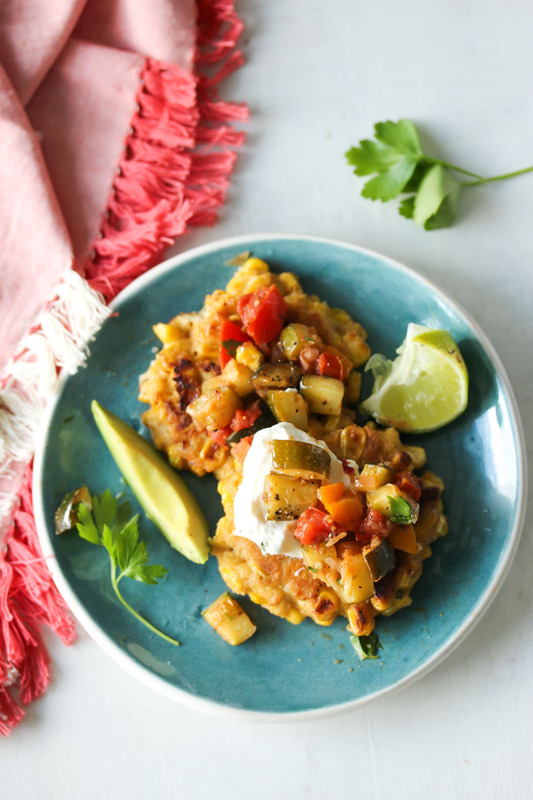 Top corn fritters with Greek yogurt (if desired) and roasted zucchini salsa. This recipe looks like so much work but it’s sooo easy…perfect for my next neighborhood potlock! Can’t wait to try it! Hi Jessica! Don’t you love when that happens?! Haha I hope you enjoy it!! Thanks for stopping by! Another good one! I find myself saving the majority of your recipes. Thanks for all your hard work.